The disc-like object on Venus that Russian scientist Leonid Ksanfomaliti claims is a living creature. A respected Russian scientist claims to have found signs of life on Venus in photographs taken by a Soviet probe 30 years ago. However, outside analysis suggests he is breathing life into an assortment of camera lens covers and image blurs. According to the Russian news service Ria Novosti, Leonid Ksanfomaliti, a member of the Russian Academy of Sciences who worked on unmanned Soviet missions to Venus during the 1970s and '80s, has written a new article in the journal Solar System Research. 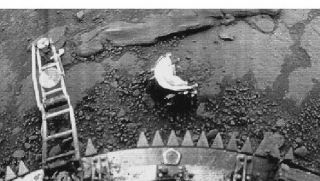 In the article, he calls attention to several objects photographed by the Venera-13 landing probe, a spacecraft that landed on Venus in 1982. The objects — including features described as a disc and a scorpion — appear to change locations from one photo to the next. "Let's boldly suggest that the objects' morphological features would allow us to say that they are living," Ksanfomaliti stated, according to Ria Novosti. Whether the scientist really has suggested that the old photographs contain living creatures that were somehow overlooked previously, or whether his words have been mistranslated, misconstrued or should have been quietly ignored, the claim has made headlines around the globe. According to Jonathon Hill, a research technician and mission planner at the Mars Space Flight Facility at Arizona State University, who processes many of the images taken during NASA's Mars missions, higher-resolution versions of the Venera-13 images show that the crab-like object is actually a mechanical component, not a living creature. The same object shows up in a photograph taken by an identical landing probe, Venera-14, which landed nearby on Venus. "If those objects were already on the surface of Venus, what are the chances that Venera 13 and 14, which landed nearly 1,000 kilometers apart, would both land inches away from the only ones in sight and they would be in the same positions relative to the spacecraft? It makes much more sense that it's a piece of the lander designed to break off during the deployment of one of the scientific instruments," Hill told Life's Little Mysteries, a sister site to SPACE.com. According to NASA, the half-circle components are camera lens covers that popped off the Venera probes after they landed. As for why they appear to be in different places in the two Venera-13 photos, "Venera-13 had two cameras, one in front and one in back. The one image shows the front camera lens cap and the other shows the rear camera lens cap, not one lens cap that moved," said Ted Stryk, a photo editor who reprocesses and enhances many NASA and Soviet space program images. In fact, the half-circle objects are famous for being lens caps, because the one that popped off Venera-14's camera landed exactly where a spring-loaded arm was meant to touch the Venusian surface in order to measure its compressibility. The lander ended up measuring properties of the cap. The other photograph highlighted by Ksanfomaliti, which supposedly shows a scorpion-like creature, contains a blur. "The features that Ksanfomaliti shows are nothing more than processed noise, at best, in some particularly bad versions of the images. They are not in the original data," Stryk said. Or, as Hill put it, the image is an example of "letting your mind see patterns in low-resolution data that simply aren't real." This story was provided by Life's Little Mysteries, a sister site of SPACE.com. Follow Life's Little Mysteries on Twitter @llmysteries or on Facebook.